White men hold the key to November’s general election for Donald Trump given his success with the group in the primaries. But women could play an even bigger role for Democrats with Hillary Clinton as their standard bearer. After all, if Barack Obama could cultivate extraordinary enthusiasm among blacks and other racial minorities, couldn’t Hillary Clinton, as the first major party female nominee, do the same for women? Women have long been important for Democratic presidential candidates, who have gotten more votes from them than men since 1980. Their support was crucial for Barack Obama for in 2012, as he received 55 percent of the women’s vote, while Mitt Romney took 52 percent of men. But if Clinton winds up in a contest with Donald Trump she may need them more than ever. On the other hand, white married women, especially those without a college degree, have a history of voting Republican. 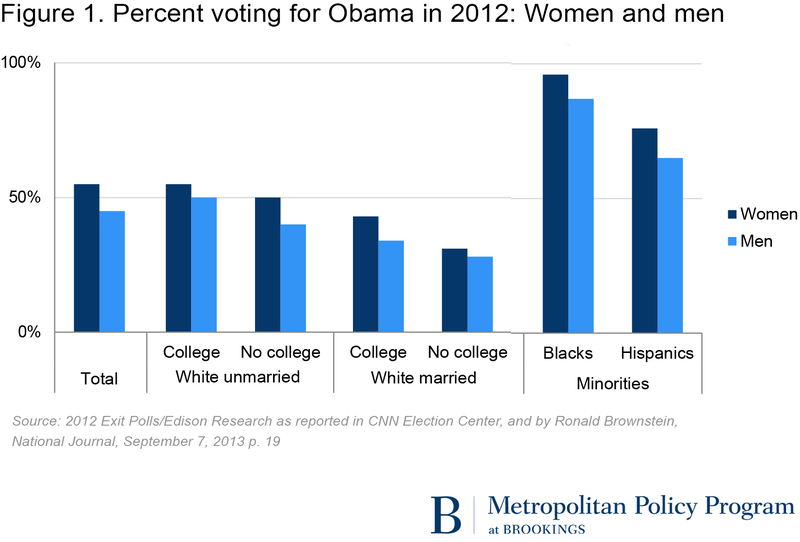 In 2012, only 31 percent of white married noncollege women voted for Obama. 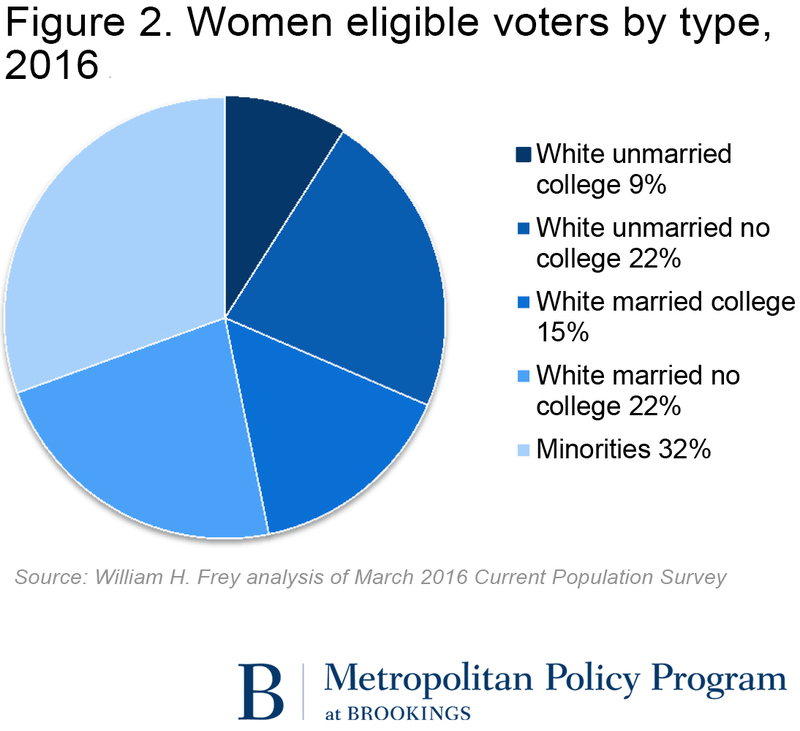 These most Republican women represent 22 percent of all eligible women voters; another 15 percent, white married women with college degrees, are also prone to vote Republican, though less strongly so (Figure 2). Among all of these white groups, as with racial minorities, men voted less Democratic than women in 2012—an election where gender-related issues were not nearly as sharply defined as they are likely to be in a Clinton-Trump matchup. This was the case not only nationally but in all major battleground states (See Table 1). The Republican and Democratic primaries this year show that Trump’s support is more strongly male and Clinton’s is heavily female, suggesting an even more gender tinged general election in November. Trump’s defamatory comments about women and his views on abortion are seemingly behind strong negatives toward him in polls of all women, as well as with married women. His most consistent polling strength so far is among men and the white working class. Of course, his messages will appeal to some women concerned with a perceived loss of American greatness who believe solutions may be found by curtailing international trade and immigration. Clinton’s messages on domestic policy focus more directly on women’s issues including early childhood education, paid family leave, reproductive rights, and pay equity, as well as—to appeal to younger Bernie Sanders voters—college costs and the minimum wage. Many of these proposals will also draw in some men, though polls show she does worse with them in hypothetical Trump-Clinton match-ups. Yet Clinton needs to be concerned with what might be called Trump’s “inside straight” strategy which would rely heavily on the support of white males, especially those who are married and do not have a college degree. In the Electoral College, this strategy could be used to take “whiter” battleground states such as Ohio and perpetually close states in the South and West. To gain the popular vote with this strategy, Trump would have to improve over 2012 Republican candidate Romney’s already strong performance with white men by 4 points (from 62 percent to 66 percent) as well as improve white male turnout by the same amount. Projections indicate that similar turnout and voting shifts among white men at the state level would provide Trump with wins in former Obama states of Ohio, Florida, Pennsylvania, and Colorado (See Table 2). The latter would net Trump an Electoral College win if all other states voted Democratic or Republican as they did in 2012. These projections—the very best case scenario for a Trump white male targeting strategy—assume that the women’s vote would not change. But that could be risky, especially with stronger turnout and more partisan voting of more Democratic leaning white unmarried women. Add in less Republican voting among alienated white married women—who are already less partisan than their husbands—and even an outsized white male vote for Trump could be countered (See Table 2). Clearly other important voting blocs will come into play including Hispanics, African Americans, millennials, and independents among others. But the sharply focused gender messages that are already emerging in the primary campaigns suggest that both party’s candidates will be need to pay attention to the issues and votes of men and women in the run-up to November’s election. And for potential nominee Hillary Clinton, this may require a supersized effort to capture the woman’s vote.